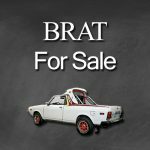 Please note that BRATForSale.com is not directly involved in the sale of any vehicle, part or accessory list for sale on this site. The goal is simply to facilitate the buyer and seller meeting to complete the transaction on their own terms. Our goal is not only to display current BRATs for sale but also to act as a living database for both potential buyers and sellers. The idea is to provide a rolling tally of what BRATs have been listed for in various conditions and in different regions. The ultimate mission is that this site will be a historical resource and provide an ongoing fair market value calculator for the Subaru BRAT. If you would like to report an ad as SOLD or are a seller and would like your personal info removed. Please send us a message on our Contact page. BRATForSale.com is not endorsed by, sponsored or in any way affiliated with Subaru or the Fuji Heavy Industries conglomerate. This site is also not related to or affiliated with Craigslist or eBay. Trademarks and Brands names are used on this site in conjunction with the Fair Use clause of US copyright law.